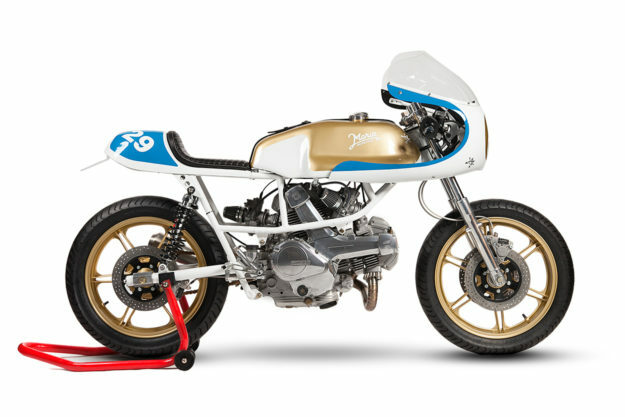 The Pantah is one of those bikes from the 1980s that looks a little awkward today. 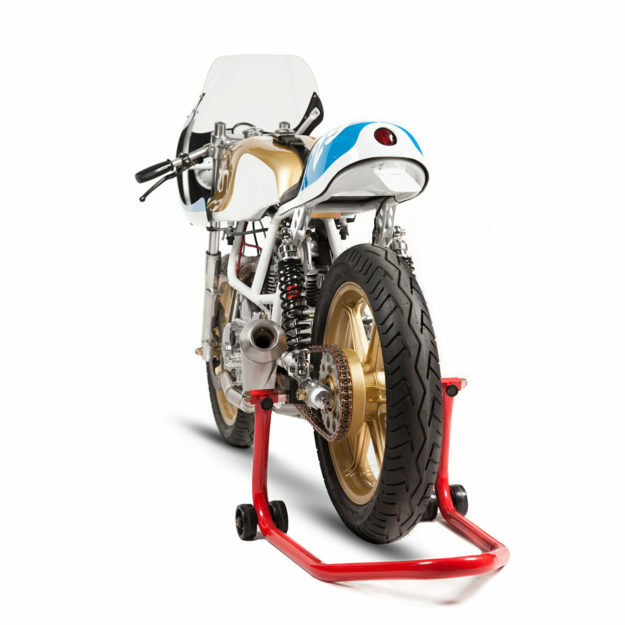 But let’s not be too unkind: It set the template for modern Ducatis, with a trellis frame, belt-driven cams and a desmo valve system. From an engineering perspective, you could say that Fabio Taglioni’s swansong was also his finest hour. So we’re always pleased to see a custom builder do justice to the famous engineer’s work. 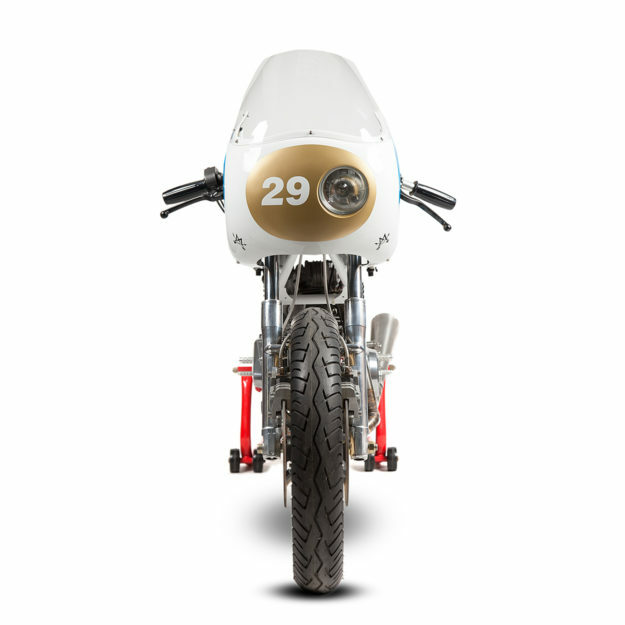 Maria’s client has a soft spot for vintage race bikes, so that became the theme. But first, Luis and crew had to figure out what to do with the engine. Rather than scrap it, they sent it to one of Europe’s leading Ducati specialists, Ducati Technical Services of Wakefield in England. 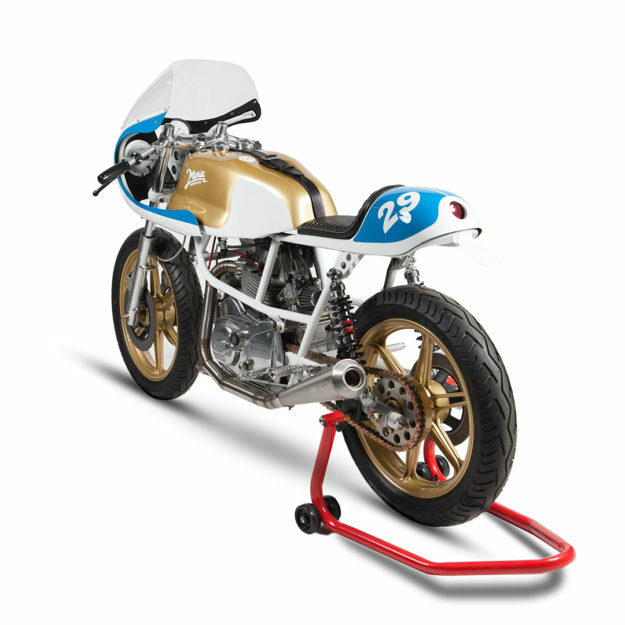 DTS is owned by Paul Klatkiewicz, a former racer, and he’s been rebuilding classic road and race Ducatis for 40 years. 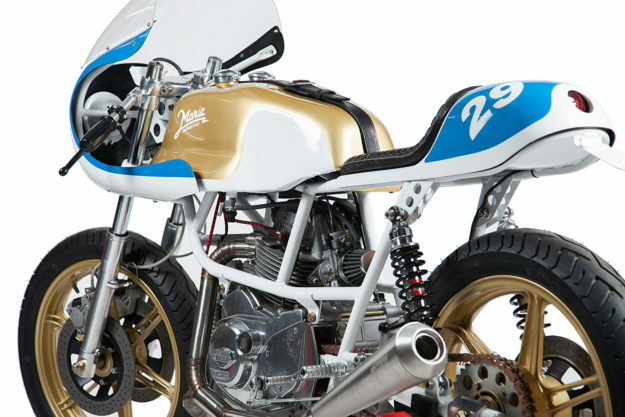 Two months later, the engine returned to the Maria Motorcycles workshop. And for once, the tired old phrase ‘As good as new’ was appropriate. 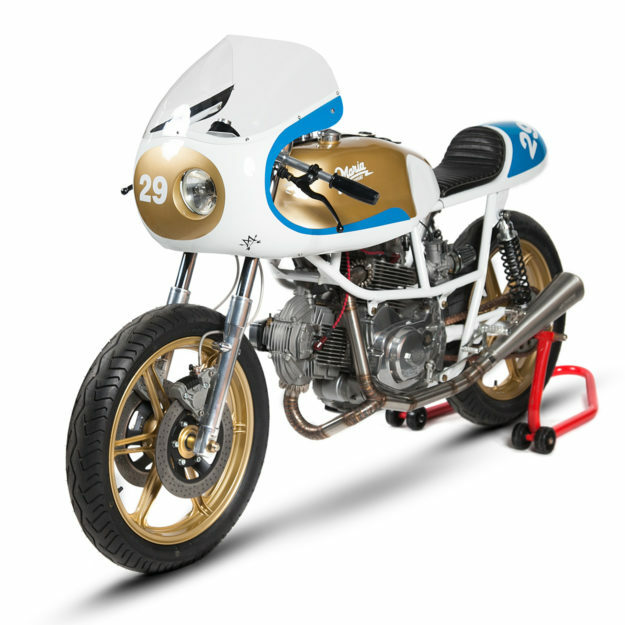 The Pantah now had a zero-kilometer engine, and a useful boost to 600cc, matching the upgrade Ducati made in 1981. The frame was detabbed and smoothed over, with all unnecessary supports and brackets dumped in the bin. Then it was powder coated pure white. 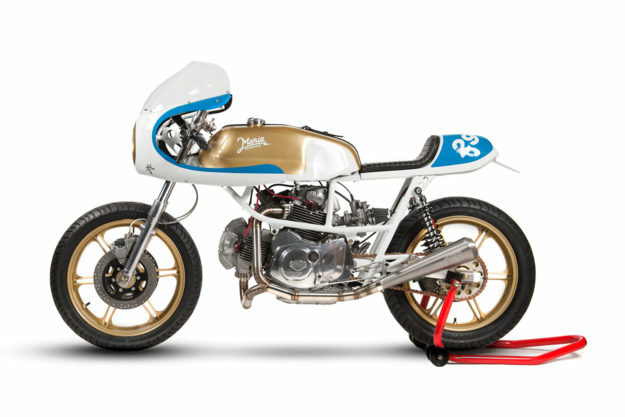 The ideal tank would be an Imola-style old school aluminum tank. 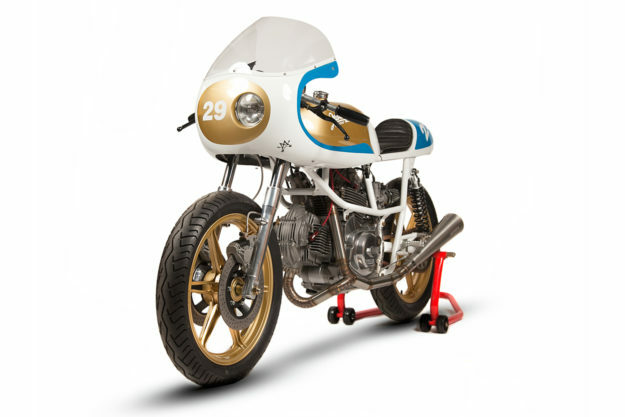 So Maria approached the Welsh company TAB II Classics, who made an Imola replica designed to fit the Pantah frame. 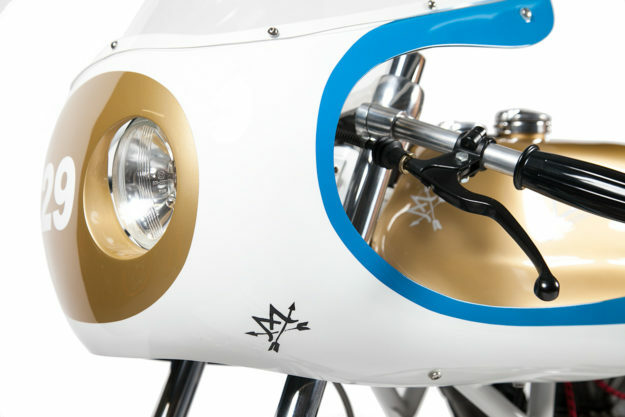 The fiberglass fairing is a modified off-the-shelf item, fettled to suit the design look, and with an asymmetrical headlight hole also added. 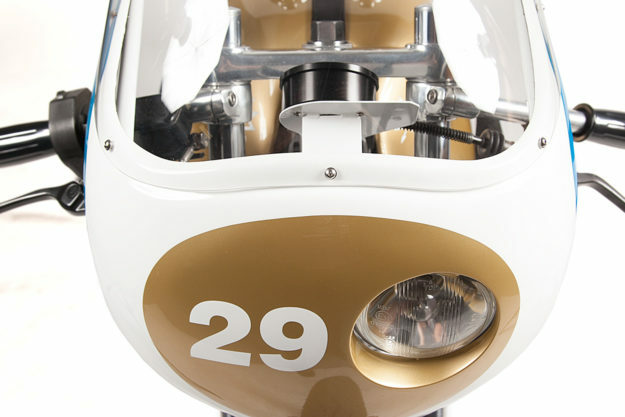 The front suspension is the original Marzocchi fitment. “The triple trees are beautiful old parts, so we decided to restore them as much as possible, and polish them.” The clip-ons are the original fitments too, but the shocks had disappeared—so Maria have installed a pair of Bitubos. Maria sculpted the tail unit in foam, and then made a single piece in fiberglass to match the fairing. The seat is covered in vintage-look leather to give a premium final touch. The braking system has been completely overhauled, sandblasted and restored to as-new, with stainless steel Hel lines tightening up the response. The electrical system was missing, so a new loom went on with a simple Motogadget speedo tucked behind the fairing and little more. Most of the wiring is hidden under the frame tubes, and the lithium battery and major electric hardware is concealed under the tail unit. 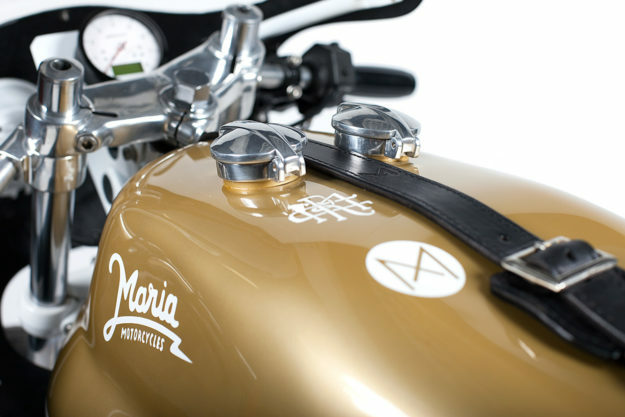 Maria usually hand-make their own exhaust systems, in stainless steel—and with small welded-together segments rather than complete bends. It looks perfect here, topped off with a Spark muffler. With modern cone filters on the intake side, Maria retuned the carbs to make the most of the blueprinted engine. 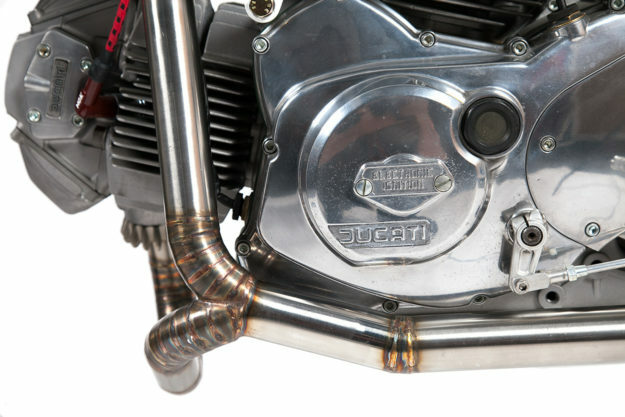 The final touch is a leather belt that holds the tank to the frame, passing between two Monza gas caps. And lots of style too—an attribute sadly missing in many of today’s production machines, thanks to the ever-tightening noose of regulation. Kudos to Luis Correia and his crew for this delightful reminder of a bygone age.